The Arkansas Bar Foundation was established in 1958 to support efforts at improving the administration of justice. The Arkansas Bar Foundation, which is classified as a tax-exempt organization under Section 501 (c) (3) of the Internal Revenue Code, is a charitable organization with a mission to promote educational, literary, scientific and charitable purposes. 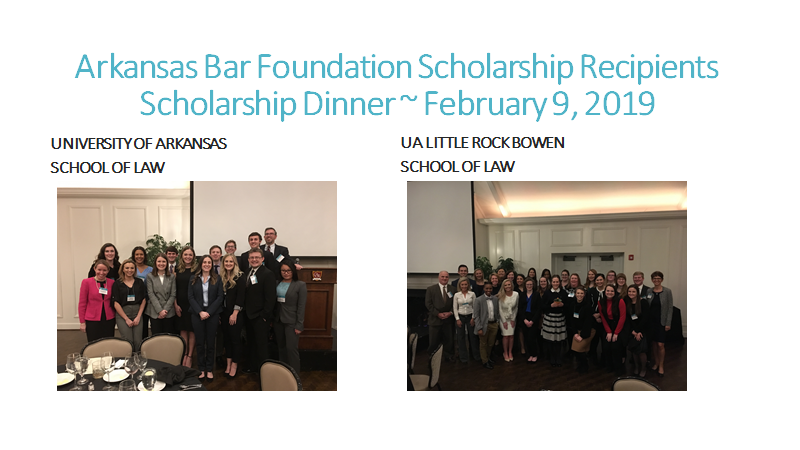 Each year, the Foundation awards approximately 48 endowed law school scholarships to students at the University of Arkansas School of Law in Fayetteville and the UALR Bowen School of Law in Little Rock. An Arkansas Bar Foundation Professor of Law has also been established at each Arkansas law school. This year's dinner was held on February 8, 2019 at the Country Club of Little Rock. Over the years, the Foundation has funded special law-related projects to organizations whose projects fall within the guidelines in the Foundation’s goals and objectives. The Foundation has been a major supporter of the statewide Mock Trial Competition; efforts to educate the public about their right to make justice more accessible to more Arkansans; and, continuing education of newly admitted attorneys through the Bridging the Gap seminar. Attorneys in good standing are invited to become Fellows of the Foundation. The current financial requirement to become a Fellow for a lifetime is a payment of $2,000.00, which may be paid in ten (10) semi-annual installments of $200.00 each over a five year period. Contributions are tax deductible for federal income tax purposes. Upon the receipt of the pledge and initial payment, the attorney is considered a Fellow with rights of membership to attend meetings and dinners of the Foundation. After the contribution has been paid in full, the Fellow's picture will be displayed permanently as part of the Hall of Fellows in the lobby at the Arkansas Bar Center. Fellows and Sustaining Fellows are recognized annually in a published report. The cost of operation of the Foundation is paid by the rent received from the Arkansas Bar Association as a tenant in the Arkansas Bar Center and from Sustaining Fellow contributions. Fellows who wish to become Sustaining Fellows are invited to do so by making an annual, voluntary contribution of $100.00. Lawyers who wish to become Fellows and Fellows who wish to become Sustaining Fellows should contact Ann Dixon Pyle, Executive Director of the Arkansas Bar Foundation at 501.375.4606, ext. 110 or by writing to the address listed above. The Arkansas Bar Foundation owns the Arkansas Bar Center, located at 2224 Cottondale Lane in Little Rock. It is conveniently located just five minutes west of Downtown Little Rock in the Riverdale area. This space is perfectly suited for meetings, receptions, mediations, arbitrations and depositions. To reserve space, please call the Arkansas Bar Center at 501.375.4606.